International Motorcycle Show (Intermot) Cologne, Tuesday September 30. A star of the show will be the hotly anticipated 2015 model of the Suzuki GSX-R1000L5 ABS available as a model option in certain global markets. 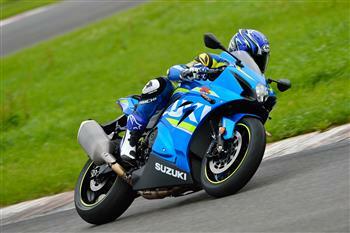 Suzuki's flagship sportsbike, the 2014 Suzuki GSX-R1000 has arrived in Australia, ready to own the racetrack. Suzuki is offering GSX-R1000 and V-Strom 650 customers sensational value on its accessory range. A selection of accessory packs are now available, providing outstanding savings. Suzuki Australia is proud to announce that an exclusive 100 units of Suzuki's GSX-R one million commemorative edition flagship sportsbike, the GSX-R1000, are now available in Australia. Suzuki's flagship sportsbike, the 2013 Suzuki GSX-R1000 has arrived in Australia, ready to own the racetrack. In exciting news for supersport riders, the 2012 model of Suzuki's flagship sportsbike, the GSX-R1000 is now available. The hotly anticipated 2012 model of the championship-winning Suzuki GSX-R1000 has been unveiled, featuring class-mastering performance, cutting-edge technology, design and engineering. 2011 Suzuki GSX-R1000 Unleashed In Australia! The hotly anticipated 2011 model of the championship-winning Suzuki GSX-R1000 has been unleashed in Australia, with class-mastering performance, cutting edge technology, design and engineering. Josh Waters has been released from hospital following his high speed crash at Willow Springs Raceway, Rosamond, California on July 7, 2010. To celebrate the 25th anniversary of the groundbreaking GSX-R range first bursting onto the world scene, Suzuki have released a special edition model of their class-defining GSX-R1000 superbike. Hot on the heels of its scintillating form in the Australian Superbike Championship, Suzuki's legendary GSX-R1000 is available in three new colour schemes following the arrival of the 2010 model. The wait is over for superbike enthusiasts - Suzuki's new generation, 2009 GSX-R1000 is now available in Australia. The new generation of Suzuki's class-defining GSX-R1000 superbike will touch down in Australia in the coming months, taking the flagship model to another level.